Once the opportunity gradient becomes negative, it becomes very difficult to get anyone to borrow money and to use the resulting debt to lead the economy forward. When the opportunity gradient becomes negative, young people are less inclined to get married, and tend to have fewer children. International organizations of countries (such as the European Union) have a harder time staying connected. The whole model of cooperation working better than “every country for itself” starts falling apart. 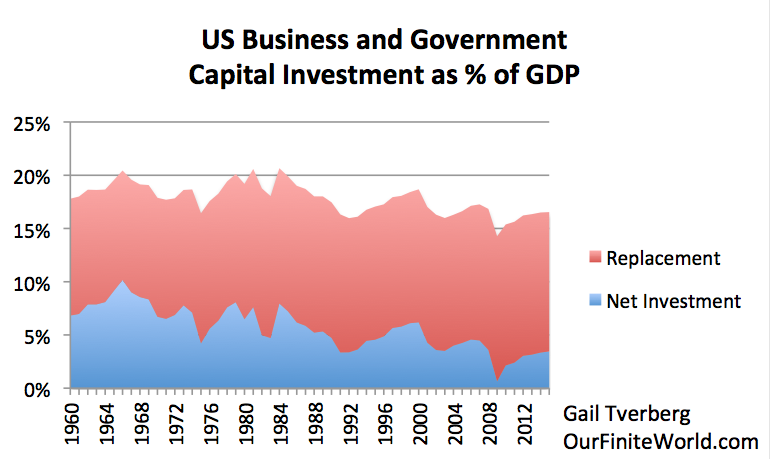 Between 2008 and 2015, only 17% of “Gross Capital Investment” actually became “Net Capital Investment.” With this small amount of true addition to capital investment, it shouldn't be surprising that what seems to be “productive investment” doesn't really raise productivity by much. It mostly raises the debt level, without necessarily providing a corresponding benefit to the economy. Many people would consider increasing complexity to be similar to improved technology, but increasing complexity really is broader than improved technology. Besides involving the development of new devices, it involves greater use of specialization, and more use of education. Businesses become larger and more international in scope, and governments offer more services. Organizations become more hierarchical as the economy becomes increasingly complex. With these types of approaches, it is sometimes possible to overcome problems associated with diminishing returns. Of course, the problem with using debt and other debt-like approaches to bring forward future revenue flows is the fact that we don't really know what the benefit of a new capital device will be, and we don't really know whether a particular individual will be able to continue paying his mortgage or other loan. Perhaps he will become ill; perhaps he will lose his job in a recession, and not be able to find another job that pays as well. With a mortgage, there is a backup possibility that the house can be sold, and its value be used to provide the necessary repayment, but we saw in the Great Recession that property values can drop, so this doesn't necessarily work either. The way today's economy is structured assumes that these future payment streams can be counted on. The value of stocks and bonds are the “assets” of insurance companies and pension plans. Banks can only exist if the loans they make can really be repaid. Our whole financial system is dependent on the current system continuing as usual, with at most a small number of loan defaults, such as are priced into the system. With the magic of borrowing and promising to pay back the borrowed amount with interest (or through share appreciation and dividends), it is possible to start with very little, and gradually create a large economy. The situation is almost like planting an “economic seed,” and nurturing it with (a) additional debt as needed, (b) a growing supply of cheap energy, and (c) a growing population of workers. As long as the debt grows rapidly, the supply of cheap energy grows rapidly, the population of available workers grows rapidly (without becoming too hierarchical), and the other types of diminishing returns listed in Section (3) don't become too great a problem, the economy can grow and prosper. There is a popular belief that GDP is the Goods and Services that an economy can make. As far as I can see, GDP is the Goods and Services that the people living in the economy can afford to buy. There is clearly a commonsense reason why this might be the case: an economy cannot grow, if the people living in the economy cannot afford to buy the goods and services that the economy produces. In the US economy, there is a .98 correlation between the growth in DPI (for all people in the economy combined) and the growth in the US GDP, as shown in Figure 2. The reason why this pattern happens is because the DPI of citizens (plus whatever amounts that governments and businesses can add to DPI) doesn't necessarily match up with the cost of making those goods and services. 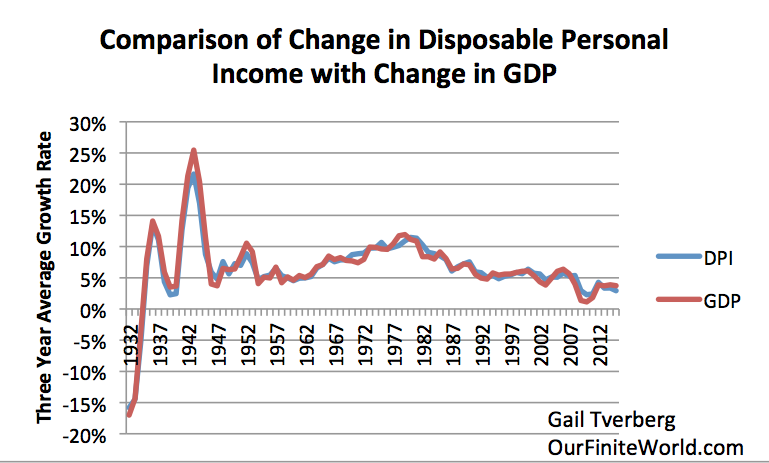 Figure 2 shows that, in recent years, the overall annual growth in US DPI and in GDP has been only about 4%. Growth of 4% doesn't go very far when it needs to cover growing population (about 0.7% per year in the US), plus inflation, plus “real” growth in wages. No wonder commodity prices get squeezed! Because of diminishing returns, the cost of their production rises far more than the modest growth in DPI can afford to cover. 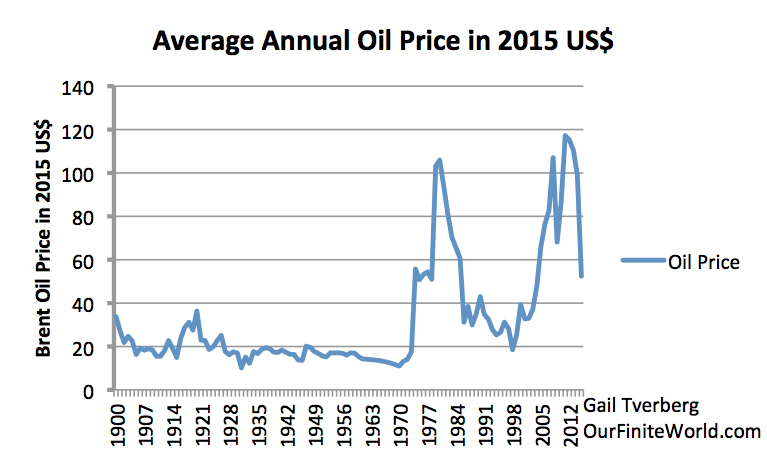 Something gets squeezed: energy prices remain far below the cost of extraction. If we look back at Figure 2, we see that the recent peak in the growth of GDP and DPI occurred about 1980, at approximately 11% per year. At 11% there is room for many economic “goodies,” including funds for new investment, raising wages, and inflation. Figure 4. 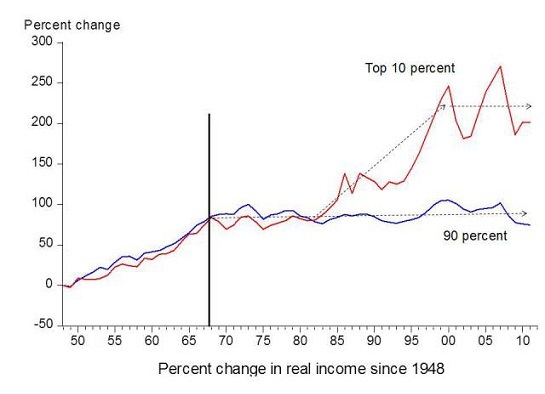 Chart comparing income gains of the top 10% to income gains of the bottom 90% by economist Emmanuel Saez. Based on an analysis of IRS data, published in Forbes. Figure 6. 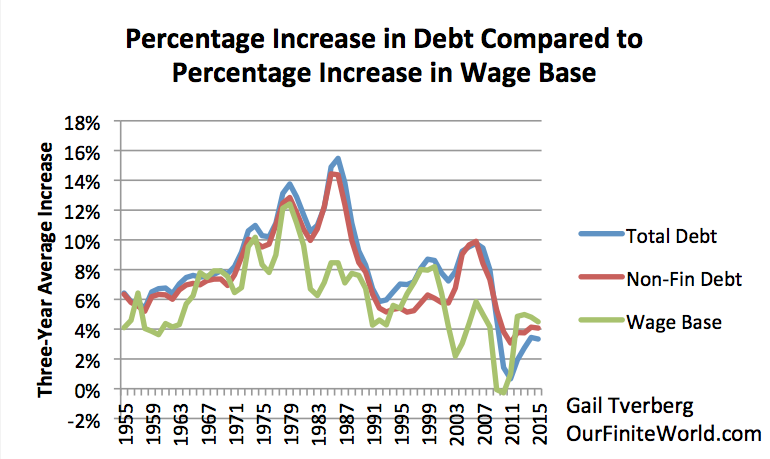 Three-year average increase in debt compared to three-year average increase in Wage Base, defined as non-governmental wages plus proprietors' income. 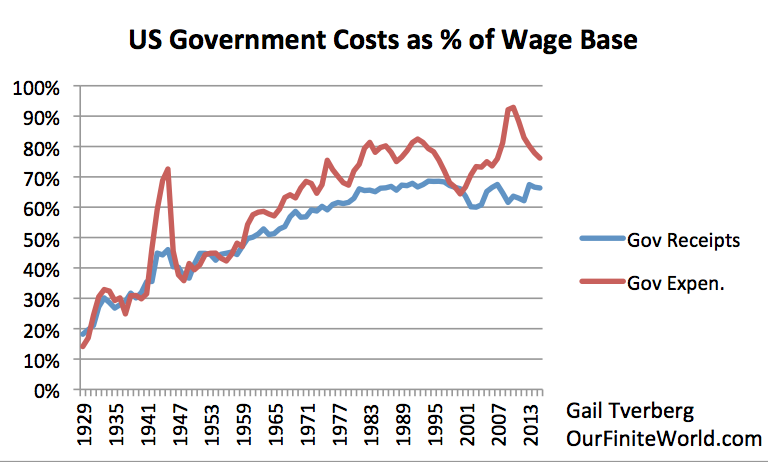 In Figure 8, Government expenditures peaked at over 90% of the wage base. Clearly these expenditures are only possible because they include a big increase in debt at the time of the bank bailouts and all of the stimulus activities. 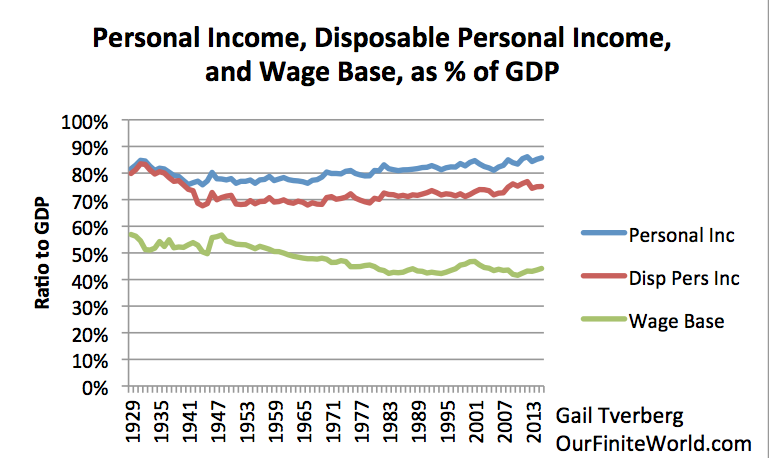 The fact that government receipts have stalled at about 66% of the wage base since 1981 suggests that there is a problem in raising taxes above the current level. We may not even be able to maintain our current tax level, if required payments for health care coverage under the Affordable Care Act behave like another tax. Since 2008, we see a different pattern. 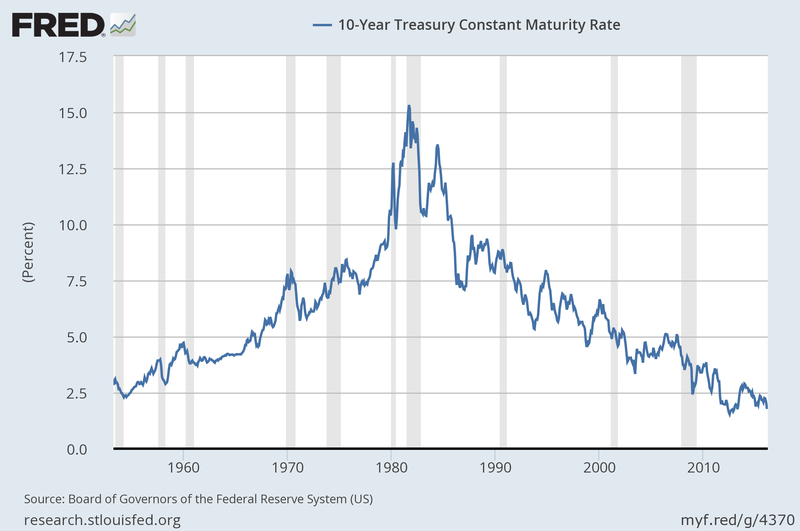 The debt level is falling, despite record low interest rates. We discussed in Section 2 the need for an “Opportunity Gradient” to encourage borrowing. At this point, there does not seem to be a sufficient Opportunity Gradient to keep borrowing at the very high 2008 level, and even grow from this point. 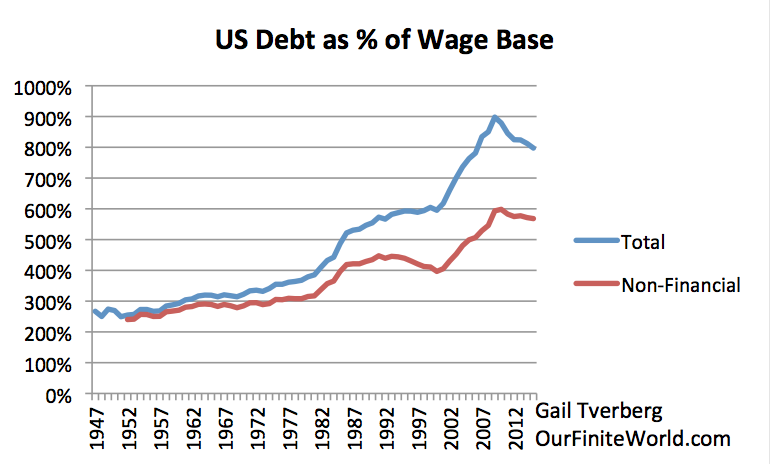 The failure of US debt to grow relative to wages is thus part of the reason why oil prices cannot be raised to a high enough level to make oil production profitable. Economies, as dissipative systems, seem to need several kinds of systems. Energy provides sustenance for an economy, in a way similar to the way food provides sustenance for humans. The debt system acts somewhat similarly to the way a human's circulation system works; the time-transfer mechanism provides a pumping action similar to that of the heart. The pricing system acts very much like a human's sensory system; it allows the system to discern whether the current opportunity gradient is sufficient to justify adding more debt. Thus, this analysis suggests that one way the system may fail is through commodity prices that fall too low. Most people have never considered the possibility that this could happen.